On December 27, 2017, the Oakland City Auditor released a Zero Waste Requests for Proposals Performance Audit. An informational agenda report with attachment A and attachment B, providing a further update on the outcome of efforts and strategies to reduce Zero Waste "push/pull" service costs for multifamily buildings was heard by the City Council Public Works Committee on September 12, 2017. An informational agenda report providing a further update on the outcome of efforts and strategies to reduce Zero Waste "push/pull" service costs for multifamily buildings was heard by the City Council Public Works Committee on February 28, 2017. An informational agenda report providing an update on the outcome of efforts and strategies to reduce Zero Waste "push/pull" service costs for multifamily buildings was heard by the City Council Public Works Committee on July 12, 2016. A status report providing an update on efforts and strategies to reduce Zero Waste "push/pull" service costs for multifamily buildings was heard by the City Council Public Works Committee on January 12, 2016. Set Maximum Commercial Organics Rates To Be 30 Percent Below Maximum Commercial Mixed Materials Rates For Equivalent Service Frequency And Container Size Effective October 1, 2015, And Setting Maximum Commercial Organics Rates To Be 25 Percent Below Maximum Commercial Mixed Materials Rate For Equivalent Service Frequency And Container Size Effective July 1, 2016. Add Rates For Additional Single Family Organics Cart Collection, Garbage Compactor Bin Collection, Commercial Cart Push Service, Roll-Off Organics Tipping Services, Roll-Off Ancillary Services, Lock And Key Services, Special Events Bin Services, And Commercial Organics Cart And Bin Collection Six And Seven Times Per Week. On October 6, 2015, the City Council adopted Ordinance 13331. On October 12, 2015, the City and Waste Management of Alameda County signed the First Amendment to Mixed Materials and Organics Collection Services Contract implementing the contract revisions authorized by Ordinance 13331. On September 24, 2015, an agenda report was released recommending consideration of an ordinance amending Ordinance 13274 which would approve Residential Recycling Collection Services Contract Section 7.08.4 (Special Unit Count Review And Adjustment), to implement a methodology to adjust the monthly cost per household for residential recycling services. On September 29, 2015, the ordinance failed. Adopting a resolution authorizing the City Administrator to negotiate an agreement with Waste Management of Alameda County to reduce rates for commercial organics collection services, and restore the low-income senior discount. Amending Ordinance 13258 to add missing rates including maximum rates for Additional Single Family Organics Cart Collection, Garbage Compactor Bin Collection, Commercial Cart Push Service, Roll-Off Organics Tipping Services, Roll-Off Ancillary Services, Lock And Key Services, And Commercial Cart And Bin Collection Six And Seven Times Per Week. On July 20, 2015, City Council took no action on the recommendations. On July 1, 2015 Oakland’s new Zero Waste Services contracts went into effect: Mixed Materials and Organics Collection Services, Residential Recycling Collection Services, and Landfill Disposal Services. Media Release – “Oakland Recycles” Launches Major New Trash, Compost and Recycling Services. 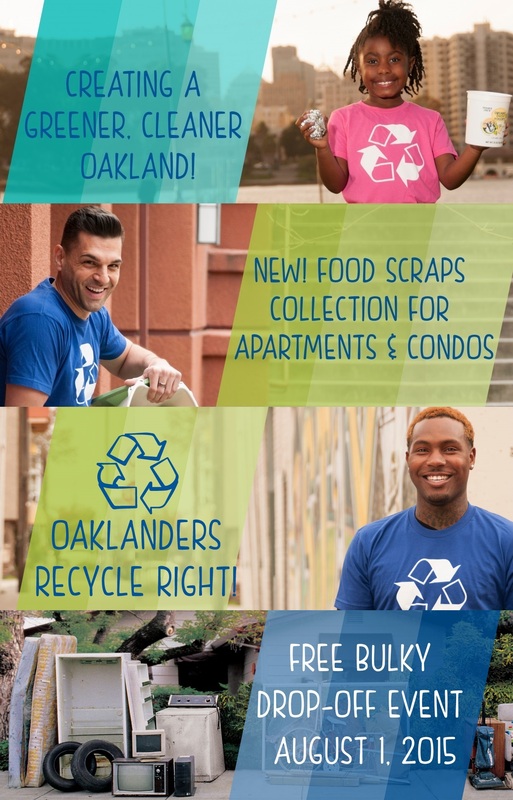 On July 1, 2015 a new program website was launched at www.oaklandrecycles.com. On Friday, May 22nd, the City and California Waste Solutions signed a contract for Residential Recycling Collection Services for twenty (20) years. An informational agenda report providing an update on the implementation of Zero Waste services was heard by City Council on March 31, 2015. A contract for Mixed Materials and Organics Collection Services for ten (10) years with two (2) five (5) year extensions at the City’s sole option. A contract for Landfill Disposal Services for twenty (20) years with two (2) five (5) year extensions at the City’s sole option. Ordinance 13273 amending Ordinance 13258 to add two "contamination rates" of $25 for the first incident in which a Contamination Rate is charged, and $50 for subsequent incidents that occur within 6-months of a prior incident for which a Contamination Rate was charged, to the established rate tables. Ordinance 13274 amending Ordinance 13254 to change the term of the Residential Recycling contract to 20 years. An ordinance clarifying that the portion of the fees received by the City from the Mixed Materials and Organics franchise that fund AB 939 Programs are designated as AB 939 Fees. An agenda report recommending two amendments to ordinances awarding Zero Waste contracts was released on November 7, 2014. The City Council will consider the report and ordinances at a Meeting on Tuesday November 18, 2014 at 5:30 p.m. The first ordinance would amend Ordinance 13254 to change the term of the Residential Recycling contract to 20 years. The second ordinance would amend Ordinance 13258 to add two "contamination rates" of $25 for the first incident in which a Contamination Rate is charged, and $50 for subsequent incidents that occur within 6-months of a prior incident for which a Contamination Rate was charged, to the established rate tables. An agenda report recommending City Council adopt an ordinance to clarify that the portion of the fees received by the City from the MM&O franchise that fund AB 939 Programs are designated as AB 939 Fees was released on November 7, 2014. The City Council will consider the report and ordinance at a Meeting on Tuesday November 18, 2014 at 5:30 p.m.
An ordinance amending the ordinance that granted the franchise for Mixed Materials and Organics collection services to California Waste Solutions, to instead grant that franchise to Waste Management of Alameda County. An ordinance amending the ordinance that granted the franchise for Landfill Disposal services to California Waste Solutions, to instead grant that franchise to Waste Management of Alameda County. A supplemental agenda report regarding Zero Waste Services franchise contracts was released on September 26. The City Council will consider the report and ordinances at a Special Meeting on Monday September 29 at 1:30 p.m. The ordinances and an agenda report are available here (note: large file may open slowly). A second reading of these ordinances is scheduled for a special meeting of the City Council at 1:30 pm on Monday, September 29, 2014. A supplemental agenda report regarding Zero Waste Services franchise contracts was released on August 11. The City Council will consider the report and ordinances at a Special Meeting on Wednesday August 13 at 5:30 p.m.
An agenda report recommending City Council adoption of a resolution to appropriate and expend funds for Zero Waste Services Transition was released on August 11. The City Council will consider the report and ordinances at a Special Meeting on Wednesday August 13 at 5:30 p.m.
On August 11, 2014, the City received a letter from Waste Management of Alameda County pertaining to the award of Zero Waste Service contracts. On August 8, 2014, the City received a letter from Waste Management of Alameda County pertaining to the award of Zero Waste Service contracts. On July 30, 2013, the City Council received a presentation from City staff recommending award of Zero Waste Franchise Agreements. Following the staff presentation, the City Council received presentations from California Waste Solutions, Republic Services, Waste Management of Alameda County, and Civicorps Schools. On July 29, 2014, the City received a letter from the Alameda County Waste Management Authority (StopWaste.Org) pertaining to the proposed CWS Interim Transfer Facility. On July 29, 2014, the City received a letter from California Waste Solutions pertaining to the risk associated with the company's Zero Waste Services RFP. On July 29, 2014, the City received a letter from Waste Management of Alameda County pertaining to California Waste Solutions' letter dated June 25, 2014. On July 25, 2014, the City received a letter from California Waste Solutions dated June 25, 2014 pertaining to the company's Zero Waste Services RFP proposal. A revised agenda report recommending the City Council conduct a Public Hearing and adopt ordinances awarding three Zero Waste Services franchise contracts was released on July 28. The City Council will consider the report and ordinances at a Special Meeting of the City Council on Wednesday July 30 at 5:30 p.m.
On June 30, 2014, the City released Addendum #4 to the BAFO Solicitation, including revised versions of the BAFO term sheet for Service Group 1 (Mixed Materials and Organics) and Service Group 2 (Residential Recycling). On June 12, 2014, the City released Addendum #3 to the BAFO Solicitation, clarifying BAFO submittal requirements. On June 6, 2014, the City released Addendum #1 to the BAFO Solicitation, including revised versions of the BAFO term sheet for Service Group 1 (Mixed Materials and Organics) and Service Group 2 (Residential Recycling). On June 4, 2014, based on City Council direction provided on May 29, 2014, the City solicited best and final offer (BAFO) proposals from California Waste Solutions (CWS) and Waste Management of Alameda County (WMAC) for Zero Waste Services, including required proposer responses to BAFO terms for Service Group 1 (Mixed Materials and Organics) and Service Group 2 (Residential Recycling). The City’s solicitation also included Service Group 1 (Mixed Materials and Organics) liquidated damages, as amended. Agenda Report to Oakland City Council Published May 19th for Garbage, Organics, and Recycling Franchise Agreements Accepting Term Sheet and Directing Staff to Prepare Rate Tables. An agenda report and resolution recommending that the City Council authorize the City Administrator to accept the term sheet for Waste Management of Alameda County for all three Zero Waste Services franchise contracts, and prepare the rate tables with any alternative selected by City Council, and bring the Ordinances to City Council for consideration and approval, was released on May 19. The City Council will consider the report and the resolution at a Special Meeting of the City Council at 5:30 p.m. on Thursday May 29, 2014. On March 18, 2014, the Oakland City Council received a memo, and adopted a resolution regarding recycling worker wages and benefits, organics collection services, bulky collection services, and local non-combustible bio-waste-to-energy facility, for waste/garbage/organics collection, disposal, or recycling franchise agreements. On February 21, 2014 the Public Works Director issued a memo updating City Council on the status of Zero Waste Services contract negotiations. On January 3, 2014, the Public Works Director issued a memo updating City Council on the status of Zero Waste Services contract negotiations. The Oakland City Council received an Agenda Report and Supplemental Report, and adopted a resolution authorizing the City Administrator to enter into simultaneous negotiations with the top-ranked proposers for the Zero Waste Services Request for Proposal. On May 23, 2013, the Public Works Director issued a memo informing City Council that two proposals were received and reviewed, a protest period was opened and closed after five days, and the "cone of silence" was lifted. On May 15, 2013, the City sent a letter informing Zero Waste RFP proposers that the protest period would open on May 17, 2013 and close on May 22, 2013. On February 21, 2013, the Director of Public Works issued a memorandum updating City Council on the status of the Zero Waste Services Request for Proposal process. On January 24, 2013, the Director of Public Works issued a memorandum confirming receipt of proposals in response to the Zero Waste Services Request for Proposal, and the Director reminded the City Council to direct all inquiries and conversations regarding the RFP to the Process Coordinator, as described by the Protocol for Process Integrity. On January 8, 2013, the City issued Addendum #14 for Service Groups 1 & 2, which revises instructions for completing From 2J (Emergency Service Rate). On January 3, 2013, the City issued Addendum #13 for Service Groups 1 & 2, which provides an updated MM&O Maximum Customer Service Rates Forms. The updated forms have increased column widths for data entry. On December 18, 2012, the City released Addendum #12 to the Collection Services portion of the Zero Waste RFP, revising dispute resolution language for both collection contracts. On December 18, 2012, the City released Addendum #7 to the Disposal Services portion of the Zero Waste RFP, adding dispute resolution language to the Disposal Services Contract. On November 16, 2012, the City released Addendum #11 to the Collection Services portion of the Zero Waste RFP, revising the due date for proposals to January 9, 2013, and providing red-lined versions of the complete RFP (including forms) and contract, and Attachment 9 (Guidance on RR Stability Funds). On November 16, 2012, the City released Addendum #6 to the Disposal Services portion of the Zero Waste RFP, revising the due date for proposals to January 9, 2013, and providing red-lined versions of the complete RFP (including forms) and contract. On November 7, 2012, the City released Addendum #10 to the Collection Services portion of the Zero Waste RFP, providing Addendum #10 Responses to Questions Received from Eligible Proposers; and revising RR Collection Form 2A (Max Customer Service Rates Forms); MM&O Collection Forms 12A-C (Facilities Information); and MM&O Contract Exhibit 2 (Refuse Rate Index). On October 30, 2012, the City released Addendum #9 to the Collection Services portion of the Zero Waste RFP, providing Addendum #9 Responses to Questions Received from Eligible Proposers; revising MM&O Services Contract Exhibit 8 Table B (Calculation of Annual Diversion Rate); and adding Attachment 8. On October 29, 2012, the City released Addendum #5 to the Disposal Services portion of the Zero Waste RFP, and providing Addendum #5 Responses to Questions Received from Eligible Proposers. On October 26, 2012, the City released Addendum #8 to the Collection Services portion of the Zero Waste RFP, providing Addendum #8 Responses to Questions Received from Eligible Proposers; and adding Attachment 7 (Guidance on Commercial Non-Exclusive Recycling Franchise). On October 23, 2012, the City released Addendum #7 to the Collection Services portion of the Zero Waste RFP, providing Addendum #7 Responses to Questions Received from Eligible Proposers. On October 17, 2012, the City released Addendum #6 to the Collection Services portion of the Zero Waste RFP, providing Addendum #6 Responses to Questions Received from Eligible Proposers; and revising RR Collection Form 2C and MM&O Collection Forms 2A, 2I and 2K. On October 15, 2012, the City released Addendum #5 to the Collection Services portion of the Zero Waste RFP, providing Addendum #5 Responses to Questions Received from Eligible Proposers; and revising Mixed Materials and Organics Collection Services Contract Exhibit 8, Table B. On October 10, 2012, the City released Addendum #4 to the Collection Services portion of the Zero Waste RFP, providing Addendum #4 Responses to Questions Received from Eligible Proposers; and adding Attachment 5 (Residential and Commercial Account Data) and Attachment 6 (Recycling and Garbage Service Collection Map). On October 4, 2012, the City released Addendum #3 to the Collection Services portion of the Zero Waste RFP, providing: Addendum #3 Responses to Questions Received from Eligible Proposers; revising MM&O Maximum Customer Service Rates Forms, Collection Services RFP Attachment 1D (Roll Off Tons Adjusted), and Collection Services RFP Table 2-1 (Calendar Year Report of Summary of Franchised Tonnage by Program Type 2012-2011); and adding MM&O Collection Services RFP Attachment 1F (Monthly Report of Summary of Franchised Tonnage by Program Type 2010-2011, Table 2-1A), Attachment 1G (Calendar Year Report of City-Generated & Hauled Tonnage 2010-2011, Table 2-1B), Attachment 3 (City Facilities with Service Levels), and Attachment 4 (City Litter Containers). On September 28, 2012, the City released Addendum #4 to the Disposal Services portion of the Zero Waste RFP, providing Addendum #4 Responses to Questions Received from Eligible Proposers. The City also released Addendum #2 to the Collection Services portion of the Zero Waste RFP, providing Addendum #2 Responses to Questions Received from Eligible Proposers, revising MM&O Collection Services RFP Form 14 (Vehicle Specifications) and RR Collection Services RFP Form 14 (Vehicle Specifications), and adding MM&O Collection Services RFP Form 13A (Bin Specifications) and RR Collection Services RFP Form 13A (Bin Specifications). On September 26, 2012, at the Zero Waste Services RFP Mandatory Pre-Proposal Meeting, the City presented oral information and a slide show regarding the RFP, and received questions from eligible proposers. The City will respond to the questions by RFP addendum. On September 21, 2012, the City released Addendum #3 to the Disposal Services portion of the Zero Waste RFP, providing Addendum #3 Responses to Questions Received from Eligible Proposers, and revised: Disposal Services RFP Form 1, Form 2, Form 5, Form 11, Form 14, Disposal Services Contract Exhibit 1 and Disposal Services Contract RFP Attachment 1D. On September 6, 2012, the City released Addendum #1 to the Collection Services portion of the Zero Waste RFP, replacing RFP Sections 1-4 in their entirety. The complete revised Collection Services Zero Waste RFP may be viewed and downloaded. On September 5, 2012 the City released the Collection Services part of the Zero Waste RFP, which included collection services contracts, at a Mandatory RFP Release Meeting. Participants were required to sign Affidavits agreeing to adhere to a Code of Conduct in order to receive the RFP and become eligible proposers. The Affidavit and the forms and policies referenced in the Affidavit were posted on this web site on August 30, 2012. Six companies signed out the RFP and provided contact information. View the presentation from the September 5th RFP Release Meeting. On September 4, 2012, the City released Addendum #2 to the Disposal Services portion of the Zero Waste RFP, revising Disposal Services Form 5 (Schedule N Declaration Of Compliance With Living Wage Ordinance), and adding Disposal Services Form 14 (Combined Schedule C-1, P, V). A legal notice announcing a Mandatory RFP Release Meeting for the collection service (Service Groups 1 & 2) agreements portion of the RFP on September 5, 2012 was published in local newspapers on August 29, 2012. On August 13, 2012, the City released Addendum #1 to the Disposal Services portion of the Zero Waste RFP, clarifying that disposal Site Information is due on Friday, August 17, 2012. The City released the Landfill Disposal Services portion of the Zero Waste RFP, which includes the Disposal Services Contract, at a Mandatory RFP Release Meeting On August 3, 2012. Participants were required to sign Affidavits agreeing to adhere to a Code of Conduct in order to receive the RFP and become eligible proposers. The Affidavit and the forms and policies referenced in the Affidavit were posted on this web site on July 30, 2012. Five companies signed out the RFP and provided contact information. Here's the presentation from the August 3rd RFP Release Meeting. The Oakland City Council adopted a motion setting the final Zero Waste RFP economic benefit provisions, following receipt of an Agenda Report and four supplemental reports. The Oakland City Council adopted a Revised Resolution that addresses evaluative criteria and weighting, rate adjustment, diversion performance measurement, and Alameda County Measure D, as described in the Council Agenda Report. The Oakland City Council adopted a Resolution setting a process and schedule for competitive procurement (RFP) for Zero Waste Contracts and establishing a Protocol for Process Integrity. The resolution adopts a revised Council Agenda Report. The Director of Public Works issued a memo that provides clarifications for the Protocol for Process Integrity. The Oakland City Council received an Agenda Report and Supplemental Report recommending a new Zero Waste System to replace existing solid waste and recycling agreements that expire in June 2015, and address waste hauling and recycling services that are currently provided apart from these agreements. In July 2011 the Oakland City Council received an informational report on development of staff recommendations to City Council for the design of a zero waste system responsive to the goal of Zero Waste by 2020 and the Zero Waste Strategic Plan. On December 27, 2017, an audit of the RFP process related to procurement of zero waste collection and disposal services franchise agreements was released by the Oakland City Auditor. Report and findings: Zero Waste Requests For Proposals Performance Audit. Oakland is pursuing the goal of being a Sustainable City - a place where we can meet our current needs while ensuring that future generations can live diverse, rewarding, and healthy lives. In March 2006 the Oakland City Council adopted a Zero Waste Goal by 2020 and in December 2006 passed a resolution adopting a Zero Waste Strategic Plan. The Zero Waste Strategic Plan (Plan) provides a framework of policies and initiatives that guide the planning and decision-making process to achieve the City’s Zero Waste Goal. Oakland continues to exceed the 50% waste reduction goal mandated by state law (AB 939), primarily through participation in residential recycling collection programs, mandatory construction and demolition (C&D) debris recycling, and businesses served by the many independent recycling companies operating in Oakland. A report to City Council recommending adoption of the Zero Waste Goal acknowledges that Zero Waste strategies will be necessary for Oakland to reach its goal of 75% waste reduction by 2010 , as well as Oakland’s over-arching sustainability goals. Zero Waste goes beyond recycling discarded materials. It considers the vast flow of resources and waste through our society and economy, and moves to eliminate waste. Oakland's pursuit of its Zero Waste Goal is guided by an Environmental Hierarchy for 'highest and best use' of materials and pollution prevention in all phases of production, use, and disposition of products and materials. Oakland's Zero Waste Goal is to cut the City's waste disposal of to 40,000 tons per year - a 90% reduction from 2005. Progress toward the Zero Waste Goal will be measured by the tons of waste landfilled annually. Residents and businesses provided input to the development of Oakland’s Zero Waste Strategic Plan through participation in meetings for the general public and business leaders. Stay informed and share information about the City of Oakland's initiatives toward the goal of Zero Waste, visit http://groups.yahoo.com/group/ZeroWasteOakland and click on "Join This Group".